The Great Prophet Yahyl would be pleased to see his prophecies coming to pass in these Last Days … and your sons and your daughters will prophesy … Yahyl 2:28. This Sabbath Day presented a first in The Great House of Yahweh. Three young Future Priests assisted the Kohans in Lighting the Seven-Lamp Menorah and carrying The Ark of Yahweh. Yahweh’s People and our beloved Pastor, Yisrayl Hawkins were filled with joy to see these young men learning and practicing priestly duties. New history begins upon the words of the Prophets of old, HalleluYahweh! As second speaker, Future Priest Deacon Melchizedek presented “protesting,” as an age-old problem. Citing examples from Genesis, Numbers, and I Samuyl we see that men have been protesting against righteousness for centuries. The deacon then helps us to see a different kind of protesting that is very active in The House of Yahweh today. With Yisrayl Hawkins as head and spokesman, Yahweh’s People have the authority, through the Peaceful Solution Character Education Program, to teach and protest “peacefully” against negative behavior. Great Deacon Tobyah presented the costly facts of the modern-day war machine that involves not only the United States but also the entire world. Boasting astronomical expenses that ironically do not achieve peace on any level, the deacon points out that The Peaceful Solution Character Education Program could achieve peaceful goals, both short and long-term, at a mere fraction of the cost. Great Kohan Benyamin’s subject “Ask of Me” addresses the core issue of stealing problems today. The grade five manual of The Peaceful Solution Character Education Program stresses the importance of asking. The Kohan brings a main point to our attention: Yahweh owns everything including Righteousness and Truth. He asks us if we think Yahweh will hand over authority to just anyone? The answer is no! Yahweh, as the owner, can set rules and only those who are willing to follow and uphold His rules will receive anything from Him. Stressing the importance of ASK, the Kohan reads from Mattithyah 7:7 and gives an acronym, Ask, Seek, Knock. As words that Yahshua Messiah spoke, we can see the value of asking. Reading several scriptures, the Kohan reminds us to ask for wisdom and be persistent, knowing that persistence requires patience. He explains that when we attend services, classes, and workshops we are in a state of asking. We need a believing mind, ready to take notes, and fully aware that we are at the right place to get the right answers. He wraps up his sermon by encouraging us to pray and be joyful in the knowledge that we have permission to seek Yahweh, the Almighty Father, and Creator of heaven and earth. The Great Kohan Yliyah presented the week’s news clips and we see a world suffering under the burden of sin. Flesh-eating bacteria in river water killed a man in less than 48 hours, and the spreading Ebola virus is raising concerns of possible global transmission of this extremely virulent/deadly virus. Sanctions against Russia reveal the failed attempts of the Middle East Quartet to bring peace to the region. The Israeli/Hamas conflict in Gaza has sparked outrage throughout the world and finger-pointing does nothing to stop the daily death toll. 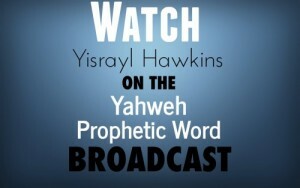 Overseer, Pastor, Yisrayl Hawkins delivered yet another riveting sermon. Describing the plague of humanity as the “the god allergy,” Yisrayl explains when the Vatican began and how it has brought misery to the world by promoting godworship and sin. The Last Days’ Witness was born in 1934, five years after the Vatican was set up in 1929. The Apostle Yahchanan, who wrote the Book of Revelations, describes the Vatican, as leader of the nations and the one who sits of the Seven Hills of Rome. Reading II Samuyl 22:31-36, Pastor explains that verse 35 shows a discrepancy and is out of context. The Great Kohan Yahodah dutifully researched through authoritative books to restore the original words. We anticipate the full disclosure in the near future. Yet, Pastor gives us a sneak preview saying that far from “training my hands to make war,” we find the original text reveals a marvelous prophecy about the chosen ones – teaching, throughout generations, atonement, and building The House of Yahweh. Rehearsing Daniyl 12 and Mattithyah 24, Pastor emphasizes these are the days – the Last Days/the Last Generation. Recent history confirms this time line: the advent of the nuclear bomb and the computer, both patented in 1934. Nuclear bombs will darken the sun and the computer enables increased knowledge – both fulfilling prophecies for the End Days. Pastor once again enlightens us on the life and purpose of the billions of micro-kingdoms. We are from the dust – the things with which the earth creeps – and the wise will possess power to resurrect the dead. With examples of Abraham and Sarah, we see obedience to Yahweh and His Laws, Statutes, and Judgments, which places them among the wise who inherit the Kingdom. The practice of righteousness earns the authority to teach as stars forever and ever, garner the trust of the microbes, and the power to resurrect the dead. We conclude with Daniyl’s vision of a great image with toes of iron and clay and Pastor reminding us that a house divided cannot stand.